Camp was fantastic and a joy to be a part of. 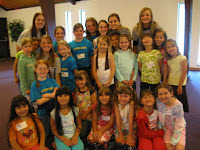 So blessed to have such a wonderful program for young children. My kids only came two days but they had a blast. My son really enjoyed the camp and I love that it was Bible based. Not only was it exciting to have our largest attended Sports Camp ever, but 12 children indicated to their coaches that they had prayed to accept Christ during the week! None of this would have been possible without the dedicated team of students (led by David Nizic) who served as coaches this week. While the kids were playing sports and hearing the word of God, a team of New Life Church women were making connections with parents. 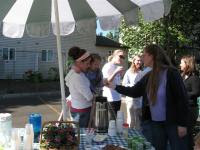 These ladies served coffee beverages and pastries to the parents who were dropping their kids off for Sports Camp. One of our life groups even got into the game this week. Dawn Currey was our concession stand coordinator. She enlisted the help of her life group to make over 200 cupcakes for our awards ceremony and lunch on Friday. 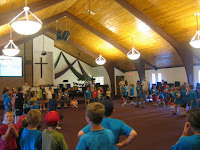 Please pray that the some of the families who came to Sports Camp and don't have a church home would connect with New Life Church. Also, pray for the children who made decisions to accept Christ. Pray that they would get rooted in the word of God and follow Jesus for the rest of their lives. What a great report! Way to go, New Life! How to Talk to Anyone! Don't Waste Your Summer: Church Calendar Updated!